Here is one more photo from my mid-January trip into Boston. I was trying out my new digital camera along the way, from the passenger seat. I noticed the clock tower, a Boston icon, and I am always trying for a good picture of it, so I gave it another try. 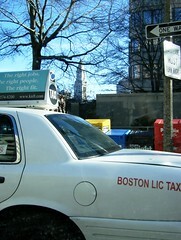 When I began to work with this image on the computer, I didn't like the fact that I didn't get a good view of the clock tower with all the stuff going on in the foreground: advertisements on a Boston Licensed Taxi, street signs, a box for the Boston Phoenix. But I also kind of liked all that stuff in the foreground, which is actually just Boston, so I cropped the photo to get this composition.